Simple repost from Robert Christy, but worth noting. August 30, Tiangong 1's controllers raised its orbit by 11 kilometres, indicating that a target date for the Shenzhou 10 mission has probably been set. As August 30 dawned, Tiangong 1 was following a 344 x 356 kilometre orbit at 42.8 degrees inclination. Soon after noon UTC, a firing of its thrusters raised perigee to create a new apogee. The orbit became 355 x 366 kilometres at the same inclination as before. It was back to the same height that had been produced by a similar manoeuvre after Shenzhou 9 departed. A history of Tiangong's orbital manoeuvres can be seen here. Before this latest adustment, Tiangong's orbit decay would have brought it back to the 330 kilometer Shenzhou operating altitude before the end of 2012. Controllers had been experimenting for a few weeks with thruster firings to control Tiangong's rate of decay very precisely. It seemed to be heading for a rendezvous with Shenzhou 10 around November 26 during one of two launch windows covering the last few days of November and the first couple of weeks in December. It was probably a 'holding pattern' based on an estimate of how long it would take to review Shenzhou 9 and prepare a new vehicle for launch with a crew. Plans may now have firmed up a little with an aim to fly the mission early in the new year. Tiangong 1's new orbit will decay to Shenzhou altitude early February, during the next pair of launch windows that extend through January to mid-February. A current estimate of the likely Shenzhou launch date can be found here. Shenzhou 10's mission is unlikely exceed Shenzhou 9's by anything significant in duration. Where Shenzhou 9 was used to test and develop the logistics and mechanics of getting a crew aboard a space station, the next flight has the aim of introducing operational routines and simulating space station life. It is set to be the final mission to Tiangong 1 which will reach the end of its two year rated lifetime next October. Its docking unit is rated for use on six occasions, and four of them have already passed with two dockings each by Shenzhou 8 and Shenzhou 9. Tiangong 1 will then steer itself to a safe re-entry and China will turn its attention to Tiangong 2. The new laboratory will be used to build more experience of space station operation so China is ready for the challenge of operating the 20-tonne core module of a more-permanent outpost towards the end of the decade. Robert Christy has been analysing and documenting space events since the early 1960s and currently provides information via his web site. What are the goals of Shenzhou-9? The launch of Shenzhou-9 (神舟九号) expected this Saturday 16 June will mark China's first human mission in nearly four years. So what's new this time around? Much has been written about this flight carrying China's first female taikonaut, but aside from proving that certain select women have nice teeth, no body odor, or scars that don't bleed, what are the goals of the Shenzhou-9 mission? In short: experience with rendezvous/docking and longer duration missions, bringing them closer to the capability of other spacefaring nations. Shenzhou-9 is China's fourth manned flight, and will use a Long March 2F rocket to launch from the Jiuquan Satellite Launch Center in central China. It's scheduled to be a two-week mission that will rendezvous and dock with the Tiangong-1 space module. While docked, the crew will test the Tiangong's life support system, perform science experiments and demonstrate technologies needed for the next stage of China's program - a Mir-class space station planned for deployment around 2020. There have been some suggestions that Shenzhou 9 might include an "undocking - re-docking" sequence during the mission in order to further demonstrate docking maneuvers. Contrary to some articles, the Tiangong-1 module is not best described as a "space station", since that term implies sufficient size and life support capacity to enable long-duration habitation. Tiangong-1 does not possess that capacity. A more accurate description of the vehicle is a "space lab" or habitation module - this is the term that the China space program itself uses. Tiangong-1 is significantly smaller than 1970s Soviet-era Salyut space stations or the American Skylab space station in the same decade. The pressurized volume of Tiangong-1 is about 15 m3, while the Salyut modules were around 99 m3 and Skylab about 320 m3. The Tiangong program, on the other hand, is aimed at the deployment of a proper Mir-sized (c. 350 m3) space station by the end of this decade. For reference, the 2011 configuration of the International Space Station is about 837 m3 of pressurized volume. While China's first piloted docking is a significant milestone, many have noted that this is a roughly equivalent technological level as America's Gemini program in the mid-1960s. This is rather misleading, however. As leading China space policy analyst and professor of National Security Affairs at the Naval War College Dr. Joan Johnson-Friese points out, Shenzhou-9 "signifies [the] Chinese commitment to incrementally achieving the three-step program they laid out in the 1990s — a patience that will serve them well in the long run." If Shenzhou-9 is successful, it will therefore mark China's accomplishment of its second goal. Moreover, these goals have been carried out cautiously but in steady progression and more-or-less on schedule. Note that while there are also indications that China seeks a manned lunar landing sometime in the mid to late 2020s, this has not been officially announced - although current press reports are still suggest it may be China's ultimate goal. For more on the strategies driving China's space program, see my popular post from April. Following some uncertainty over which of the two announced crews would fly, recent reports suggest that it will consist of Jing Haipeng (commander), Liu Wang (male pilot), and Liu Yang (female pilot). Johnson-Freese notes that the female taikonaut is important both in garnering greater international attention (and thus bolstering China's national prestige) as well as building more robust popular support for China's program. A female taikonaut will "domestically pleas[e] half the population of a country of 1.3 billion where Mao said women 'hold up half of heaven.'" This would perhaps reflect a lesson learned from the American program. Space historian Howard McCurdy noted in his book "Space and the American Imagination" that NASA blundered by not sending a female astronaut on a mission until on the seventh Space Shuttle mission in 1983 when Sally Ride became the first American woman in space. Had NASA included women on earlier missions, McCurdy suggests that public support for the U.S. space program may well have been stronger and might have mitigated the strong gender gap in enthusiasm for space that has been observed since the 1980s. The summer launch at Jiuquan may be notable, since temperatures there this week were over 36°C. This may pose difficulties for propellant fueling on the Long March 2F. Finally, Dean Cheng, a China analyst at the Heritage Foundation notes that "This [mission] is occurring in the context of a troubled Chinese leadership transition. Therefore, any trouble with the mission is likely to have bad consequences for the Chinese leadership, as it might be seen as emblematic of poor leadership, poor stewardship of the nation's vital resources, and raise questions about the legitimacy of the incoming leaders." We now have 50-50 certainty about the crew for the upcoming Shenzhou 9 mission. The vehicle will launch on a Long March 2F rocket from the Jiuquan Satellite Launch Center this Saturday 16 June, and is expected to rendezvous and dock with the Tiangong-1 habitat module for a 10 day mission. The main and backup crews were announced by China's media today, but which is which was not specified. Perhaps this has yet to be determined by a game of rock-paper-scissors. Either crew configuration will result in two "firsts" for China's space program: it will mark the first "second mission" by a taikonaut, as well as the first female taikonaut. Nie Haisheng flew on Shenzhou 6, and Jing Haipeng flew on Shenzhou 7. Wang Yaping and Liu Yang are the two female crew designates. Recent months have seen much speculation in Chinese media about which woman would be selected as the first woman taikonaut. Indeed, the same media have repeated rumors about possible drama or "competition" between Wang and Liu to be the first woman. I have serious doubts that this is true - such things simply are not done in China, which would be seen as brazen and un-Chinese. This is even more unlikely given that both women are members of the PLA Air Force where such overt self-promotion is even more frowned upon. Seems like hype to me. Wang Yaping on left, Liu Yang on right. Tony Quine at SpaceDaily has a good summary on what we know and don't know about the crews - after the jump. Doug Messier sums up the new DoD report to Congress on China's current space capability. The Defense Department’s annual report to Congress, “Military and Security Developments Involving the People’s Republic of China 2012,” includes an interesting section on that nation’s rapidly growing space program. The report finds progress across a broad range of areas from human spaceflight to global positioning systems and capabilities for disable foreign military satellites. It also cautions that the Chinese are facing issues with reliability due to a surging launch rate. The relevant section is reproduced below. Space and Counterspace Capabilities. In the space domain, China is expanding its space-based surveillance, reconnaissance, navigation, meteorological, and communications satellite constellations. China continues to build the Bei-Dou (Compass) navigation satellite constellation with the goal of establishing a regional network by the end of 2012 and a global network by 2020. China launched the Tiangong space station module in September 2011 and a second communications relay satellite (the Tianlian 1B), which will enable near real-time transfer of data to ground stations from manned space capsules or orbiting satellites. China continues to develop the Long March V rocket, which will more than double the size of the low Earth and geosynchronous orbit payloads that China will be capable of placing into orbit. In parallel, the PRC is developing a multidimensional program to limit or deny the use of space-based assets by adversaries during times of crisis or conflict. In addition to the direct-ascent anti-satellite weapon tested in 2007, these counterspace capabilities also include jamming, laser, microwave, and cyber weapons. Over the past two years, China has also conducted increasingly complex close proximity operations between satellites while offering little in the way of transparency or explanation. China’s space and counterspace programs are facing some challenges in systems reliability. Communications satellites using China’s standard satellite launch platform, the DFH-4, have experienced failures leading to reduced lifespan or loss of the satellite. The recent surge in the number of China’s space launches also may be taking its toll. In August 2011, in the third satellite launch in seven days for China, a Long March 2C rocket (carrying an experimental Shijian 11 satellite), malfunctioned after liftoff. Shenzhou 9 to be ready for mid-June launch? China seems poised to launch three astronauts into space, in the middle of June, onboard Shenzhou 9, the country's fourth, and most ambitious manned spaceflight. Shenzhou 9 is scheduled to rendezvous and complete a manual docking with the orbiting Tiangong 1 module, and will stay in orbit for 13 days, more than doubling China's current endurance record. The Long March 2F rocket was delivered to the Jiuquan Satellite Launch Centre on 9th May, and it is now being checked and assembled for flight. The Shenzhou 9 spacecraft itself had arrived at Jiuquan a month earlier. In addition, the respected UK based space and satellite tracking service, www.zarya.info, has undertaken ongoing analysis of the orbital track of Tiangong 1 since it was launched last year. Zarya is now able to anticipate an eight day launch window, for Shenzhou 9, which would accommodate a two day orbital chase to rendezvous and dock with Tiangong 1, and then return to earth after 13 days, in the established recovery zone. This launch window opens in 17th June, which is 39 days after the Long March was delivered to the launch centre. Chinese officials have previously said that Shenzhou 9's flight will include a 10 day stay at Tiangong 1. The Tiangong-1, which was launched on Sept. 29, 2011, was instrumental in China's first space docking mission, in which the unmanned Shenzhou-8 spacecraft docked with the Tiangong-1 in early November 2011. 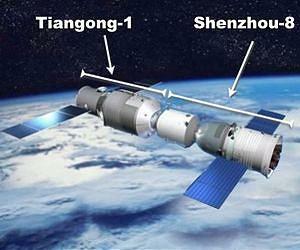 If all goes well with Shenzhou 9, another crew will visit the Tiangong 1 outpost in 2013 onboard Shenzhou 10. I generally avoid military space subjects, but this is an interesting piece from DefenseTech on the reported Chinese version of the U.S. X-37B spaceplane. It appears that rumors of the existence of the craft may be true. Known as Shenlong, it is shorter and smaller than the X-37B. And like the X-37B, the only people who really know what it does or is capable of doing aren't talking. That’s right, the rumors appear to be true. Beijing is joining the United States as the only nations with reusable spaceplane designs that are actually conducting test flights. Beijing reportedly sent its Divine Dragon — or Shenlong — space plane aloft for a successful atmospheric test flight in January, 2011. The U.S. uses its two X-37B spaceplanes for incredibly long missions doing super classified work in place, one can only guess that China’s Divine Dragon will be used for similar purposes. Here’s an excerpt from one of his latest analysis pieces on China’s military rise, titled Shenlong ‘Divine Dragon’ Takes Flight: Is China developing its first spaceplane? Shenlong’s test also reflects a shrinking time gap between when the U.S. first reveals a prototype military system and when China publicly shows a system comparable in type (if not equivalent in capabilities or immediately operational). For previous aerospace developments, China typically revealed its systems’ existence at least 15 years after the U.S. first showed its analogous platforms. Now, what are the strategic implications of China fielding its own spaceplanes? Here’s what Erickson has to say.